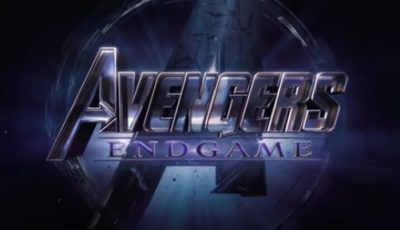 It seems the best way for a film to avoid being accused of outright plagiarism is to execute a plot that is far more convoluted than the one it is trying to emulate. Mark Fraser looks at an early 1960s Hollywood movie which blatantly attempted to outdo the logistics of its formidable predecessor. WARNING: There is a spoiler in this review for those who look for it. 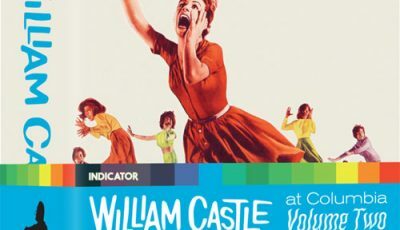 On first viewing it is tempting to write William Castle’s 1961 horror thriller Homicidal off as being completely derivative of Alfred Hitchcock’s Psycho, the granddaddy of the American shock-ending murder mystery which was released the previous year. 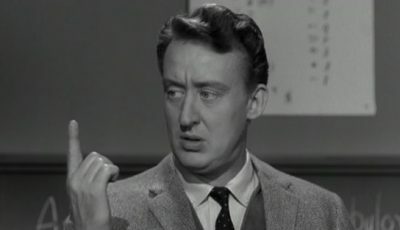 But after reading Joe Jordan’s 2014 critique of the film, it becomes obvious it’s worth some re-evaluation – regardless of the fact the Hitchcock movie was undeniably a major motivational force behind its creation. In Showmanship – The Cinema of William Castle, Jordan maintains, perhaps a little over-enthusiastically, that Homicidal is the type of work which “cannot be seen only once” due to its “astonishing” logistics. The idea for the film’s twisting plot, he says, was the brainchild of scriptwriter Robb White, who had already worked with the director on four movies between 1958 and 1960 (Macabre, House on Haunted Hill, The Tingler and 13 Ghosts). According to Jordan, back in mid-1960 the pair had noticed there were “hordes of people” waiting to see the Hitchcock movie (at the DeMille Theatre on the corner of Broadway and 47th Street in Manhattan) in a line that stretched “clear around the block” while they were premiering their own 13 Ghosts at a nearby venue. 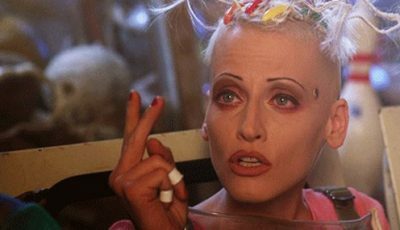 “Unlike 13 Ghosts, Psycho had already been playing for a month (it opened in New York circa June 17), and it was still playing to sold out crowds,” he writes. “Some critics claimed Hitchcock had beaten Castle at his own game. Psycho, in essence, was a modestly budgeted thriller, typical of Castle’s recent successes. “Hence (White) countered with a diabolical idea of his own. “(His) tale of homicidal murder, when compared with the other four that were written during his extended collaboration with Castle, is arguably the most entertaining. While it would be unfair to give Homicidal’s climatic “ace in the hole” away, there are some undeniable similarities between the two works which can be mentioned without venturing too far into spoiler territory. Like Psycho, the Castle film starts with a single blond woman (Emily, played by Jean Arless AKA Joan Marshall) perpetrating a crime that involves a large amount of money and spending a bit of time driving alone at night along long stretches of road. 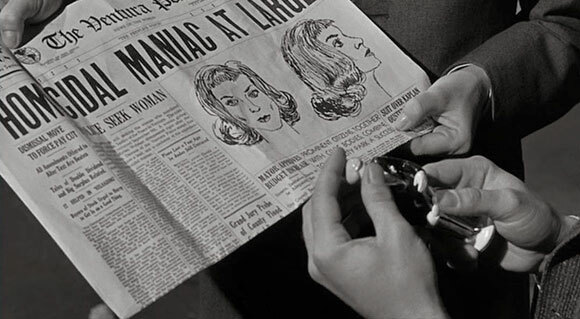 And, as with the Hitchcock movie (albeit a little sooner in the story), Homicidal contains a jolting and unexpected knife murder. 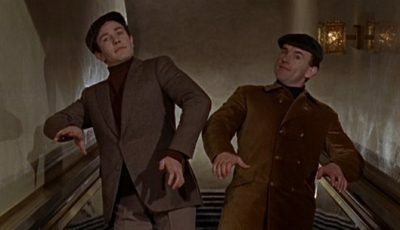 Meanwhile, its climatic moment of crazed gender-switch mayhem also takes part in a two-storey house, where a stairwell is a prominent feature of the set. Furthermore, Homicidal’s plot includes an old woman close to her dotage – the stroke-affected, wheelchair-bound housekeeper Helga (Eugenie Leontovich) – who requires a certain amount of care and attention. Unlike Mrs Bates” in Psycho, though, she is still very much alive. As suggested by Jordan, all of this is spun into a story that is far more complicated (or, one could argue, convoluted) than its cinematic mentor. Unlike the seemingly sensible Marion Crane (Janet Leigh) in Psycho, whose fall from grace arises from a momentary lapse of reason, it’s obvious Emily – who ends up being Homicidal’s main character throughout its 87 minute running time – is seriously unhinged from the start. Upon arriving at the Hotel Ventura under the name Miriam Webster, she mysteriously asks a bellhop (Richard Rust) to marry him on the proviso it be annulled the next day. Driving out into the night, they find Justice of the Peace Alfred Adrims (James Westerfield) to perform the ceremony. At the conclusion of the nuptials, however, Emily promptly knifes the JP in the stomach and flees the scene, leaving her perplexed groom and the screaming Mrs Adrims (Hope Summers) behind. 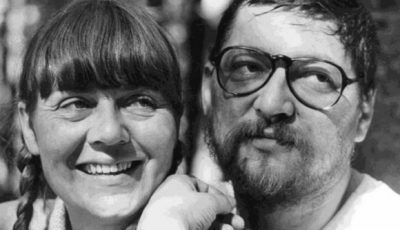 Thrown into this mix are a pair of half-siblings – the real Miriam Webster (Patricia Breslin) and her brother Warren,** with the latter set to collect a family inheritance worth $10 million over the next few days. Just to complicate matters a little further, the manipulative Emily tells Miriam that she and Warren are married. The result? Well, in its own way – and despite the above-mentioned similarities – the lower grade Homicidal does manage to stand on its own two feet, even if it is undeniably derivative of Hitchcock’s taut thriller. No doubt there are some out there who would say that such an observation is merely being nice. **This character’s stage name cannot be revealed without giving the game away. 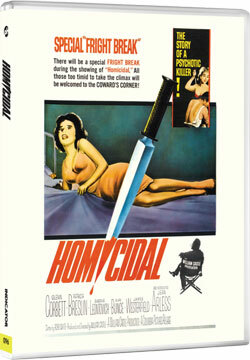 Homicidal was released as part of the Indicator Series’ Williams Castle Volume One box set. I can’t watch this without being sidetracked by its knock-off elements but there’s a creativity to its exploitation that I admire enough to give it a crazy sort of singularity. I still think the ending is good which sways my opinion of the film towards the positive.